A May pilgrimage to Turin and Rome will feature a viewing of the Shroud of Turin, anniversaries of key historical events, and a keynote address by Cardinal Raymond Burke. 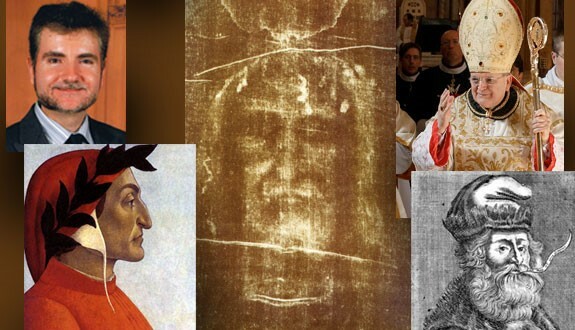 Mazza’s expertise as a professor includes medieval Europe and Church history, so in addition to viewing the Shroud of Turin, the burial cloth of Christ, and key sites in the Eternal City, the pilgrimage will focus on several important anniversaries of the Catholic Church in Europe. These include the 750th anniversary of “the call” of Blessed Raymond Lull (1235-1315), the 750th anniversary of the birth of poet Dante Alighieri, and the 450th anniversary of the Muslim siege of Malta. Dr. Mazza has visited Rome seven times, but this is his first leading a pilgrimage. He recently spoke with CWR about the trip. CWR: Your specialties include medieval Europe and Church history. How does the Europe of today differ from medieval times? What’s better and what’s worse? Dr. Edmund Mazza: The Church of medieval Europe did not have a reputation for tolerance. Catholics today, particularly since Vatican II, have been directed by the hierarchy to take a more respectful approach to non-Catholics. I believe that’s a good development. Also, in the 20th century, we learned a great deal more about human psychology. Hence, we can take steps to clinically treat people in their brokenness. However, the medieval Church was clear about its commitment to the truth of the Catholic faith. Jesus said, “I am the way, and the truth, and the life. No one comes to the Father but through me.” He did not say anything about feelings; he spoke about truth. I think there are many in Church leadership—including cardinals—who refuse to teach clearly the things that the Church has always taught. In this regard, the contemporary Catholic Church has much to learn from the medieval Church. Pope Benedict XVI told us we needed a “hermeneutic of continuity” and not one of rupture. What we do today in the Church needs to flow from what the Church has always done. The fearlessness of proclaiming the truth, even truths people of today have a hard time accepting, needs to be recovered. CWR: The life and work of Raymond Lull will be an important aspect of your pilgrimage. Who is he, and what work did he do for the Church? Mazza: Raymond was a missionary who especially dedicated his life to the conversion of the Muslims and Jews to Christianity. He is from the island of Majorca in the Mediterranean Sea, where nearly 500 years later California’s famous missionary Blessed Junipero Serra would be born. Raymond was a knight, and a troubadour who composed romantic literature. As a young man, he had five visions of Christ crucified and it changed his life. He traveled to Spain and visited its shrines and then devoted the rest of his life to preaching the Gospel. His work was very much in line with Pope Benedict’s famous 2006 lecture in Regensburg, Germany. Like the pope, Raymond believed that reason will help us reach those who do not accept the truth of the Gospel. Raymond said that the final goal of his art, or method of evangelization, was to help Muslims and Jews to discover the truth. He’d begin with basic assumptions monotheists—Christians, Muslims, and Jews—would accept about God, such as his wisdom, power, or will. He’d then segue into teachings of Christianity, such as belief in the Trinity or the Incarnation. Ours is not a culture that sees truth as the criterion of getting along with one another. We more have the attitude, “That may be your belief or your custom, but don’t impose it on me.” I believe if we reawaken Blessed Raymond’s perspective on religious truth, it would be tremendously beneficial for the Church and community. We will have common beliefs and a generally shared morality, which will lead to a more harmonious society. CWR: So Catholics need to revive the traditional Catholic practice of prayer and sacrifice for the conversion of non-Catholics? Mazza: Absolutely. We just celebrated the feast day of Our Lady of Lourdes. Mary said to Bernardette, “Penance! Penance! Penance!” She repeated her plea at Fatima. We need to make reparation for sin, and offer up our sufferings for the conversions of Muslims and Jews. Sufferings offered up with prayers always makes them more effective. CWR: You’re also going to be discussing the work of another evangelist of the era named Raymond: St. Raymond of Peñafort. Mazza: Yes. I did my doctoral dissertation on St. Raymond. He was a Dominican, was also committed to the conversion of Muslims and Jews and was a contemporary of St. Thomas Aquinas, a fellow Dominican. In fact, St. Raymond was a mentor to St. Thomas, and asked him to write Thomas’ famous Summa contra Gentiles, which served as a handbook for missionaries in refuting the errors of Muslims and Jews. St. Raymond was unprecedented in his missionary approach. While preachers of the era were focused on bringing back fallen away Catholics, Raymond established Arabic and Hebrew language schools so his friars could learn these languages and better engage Muslims and Jews. Modern scholars are often hostile to Raymond, branding him as an “evil genius” of intolerance for having the temerity to lead Muslims and Jews to the truth. The irony is that St. Raymond was called on by Pope Gregory IX to rearrange and codify canon or Church law, in which he included legal protections for Jews to protect them against intolerance. You’ll see, for example, that Jews were not allowed to be molested or attacked, or that their cemeteries were not to be desecrated, all due to Raymond’s influence. Like Pope Gregory, Raymond believed that Jews and Muslims should be reached not through compulsion or threats, but through sweet words and mildness. CWR: The title of your pilgrimage is “Conversion and Coexistence.” Why did you select this name? Mazza: Both Raymond Lull and the poet Dante sought personal conversion. We discussed Blessed Raymond; with Dante, we can gain some insight into conversion by looking at his most famous work, Inferno, the first part of his Divine Comedy. In Inferno, Dante is a character who begins with a journey through hell. Of hell, Our Lord said, “For wide is the gate and broad is the way that leads to destruction, and many there are who enter that way.” Dante demonstrates in vivid ways the reality of sin and the reality of hell, and the need for us to turn from this path. That’s why we’re starting our pilgrimage in Turin, where we’ll visit the Duomo which houses the Shroud of Turin. The Shroud has an image of what many Christians believe is the face of Christ crucified. This is the Christ we’re all called to know and follow. Once we’ve had a personal conversion ourselves, we’re called to help convert our neighbor, because we are, in fact, our brother’s keeper. And, for those who will not convert, we’ll explore how we can get along with them. This is the hot topic right now, considering the many acts of terrorism being committed by Muslims. I took note, in fact, that the very day the Muslim gunmen were killing the Charlie Hebdo staff in Paris, January 7, was the feast day of St. Raymond. CWR: How did Cardinal Burke get involved? Mazza: He has received much attention in the media recently because he is someone who is not afraid to proclaim the truth of Christ. He is an unapologetic Catholic, not caught up in the trappings of his office. One of the remarkable things about the saints is that they could demonstrate seemingly contrasting virtues. They could be tenaciously dedicated to the truth…some would say rigid…but at the same time compassionate and gentle to those who stray from it. I think this describes Cardinal Burke well. He very graciously agreed. He has since become patron of the Sovereign Military Order of Malta, which is also of historical significance. It was 450 years ago that Muslim Turks began the great siege of Malta. The Turks wanted to use Malta as a base so that they could attack Rome. They threatened to water their horses in the fountains of St. Peter’s Basilica. The Knights of Malta under 70-year-old Jean Parisot de Valette defended the island. They were outnumbered 10 to 1, but held on long enough so that the Turks decided to withdraw. The cardinal has yet to send me an outline of his remarks, but I’m hoping he’ll include mention of the successful defense of Malta. Malta, incidentally, is one of a few places in the world that has retained a strong Catholic identity. The Catholic faith is enshrined in their constitution. Abortion is still illegal there; divorce was only legalized in 2011. I suspect that there will be tremendous pressure from the larger nations in the EU for them to liberalize their public policy. CWR: What are you hoping people will walk away with when they complete the pilgrimage? Mazza: I’m hoping they’ll be closer to Our Lord; He is the vine, we are the branches. I want us to be strengthened as members of the Mystical Body, learning to better coexist with the unconverted without throwing truth overboard. For more information about the pilgrimage, please email emazza@apu.edu or info@thecatholictour.com. Visitors to Rome may attend Cardinal Burke’s presentation without being part of the pilgrimage.